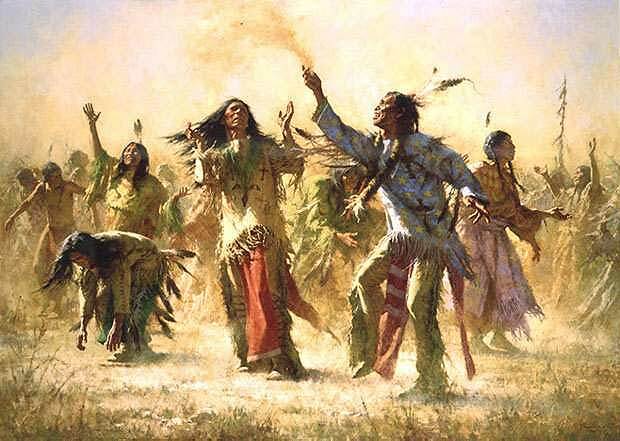 The Ghost Dance (Caddo: Nanissáanah, also called the Ghost Dance of 1890) was a new religious movement incorporated into numerous American Indian belief systems. According to the teachings of the Northern Paiute spiritual leader Wovoka (renamed Jack Wilson), proper practice of the dance would reunite the living with spirits of the dead, bring the spirits of the dead to fight on their behalf, make the white colonists leave, and bring peace, prosperity, and unity to Indian peoples throughout the region. The basis for the Ghost Dance, the circle dance, is a traditional form that has been used by many Indian peoples since prehistoric times, but this new ceremony was first practiced among the Nevada Paiute in 1889. The practice swept throughout much of the Western United States, quickly reaching areas of California and Oklahoma. As the Ghost Dance spread from its original source, Indian tribes synthesized selective aspects of the ritual with their own beliefs. The Ghost Dance was associated with Wilson's (Wovoka's) prophecy of an end to white expansion while preaching goals of clean living, an honest life, and cross-cultural cooperation by Indians. Practice of the Ghost Dance movement was believed to have contributed to Lakota resistance to assimilation under the Dawes Act. In the Wounded Knee Massacre in December 1890, United States Army forces killed at least 153 Miniconjou and Hunkpapa from the Lakota people. The Lakota variation on the Ghost Dance tended towards millenarianism, an innovation that distinguished the Lakota interpretation from Jack Wilson's original teachings. There is a lot of ghost-dancing going on these days. Conservatives chant the old mantras of limited government, low taxes, and THE CONSTITUTION (their ghost-shirt) to resurrect Ronald Reagan and drive the godless heathens into the sea. Liberals screech about “Nazism” and “fascism” (neither of which survived World War 2) and pine for a newer, darker Franklin Roosevelt to confiscate all the guns and turn us into a Scandinavian social democracy. Both are hilariously backward-looking and inapt. A government with over 300 million people to tax is not going to be limited, and I don't care what you write into its charter. Low taxes mean nothing when the government just prints all the money it needs. Social democracy only works, assuming it ever works, so long as you have more net producers than net consumers and everyone puts their shoulder to the wheel. We no longer have the demographics, the mean IQ, or the cultural consensus for either ideal. The world has changed but the hunter-gatherers don’t have a lot of attractive options when the farmers show up. So in the face of irrevocable change the conventional thinkers double down on their invocations and dance frantically to exorcise the demons polluting the land. The fly-over people, God bless them, saw that things had changed and voted for a coarse 70-year old billionaire who's never held public office. Conservatives are an easier target for this critique since "conservatism" is, one might say, backward-looking by definition. But above all else one must be a realist; to be realist is to embrace truth. The Old Calendarists are an example of extreme conservatism, dutifully following a calendar which no longer reflects the actual movements of the God-created celestial bodies. Or Orthodox following an ecclesiology based on the administrative structure of an extinct Empire. But I digress. It is noteworthy too how in the current political debates the liberals rely less on their traditional Year Zero rhetoric and more on a rehash of 1965, or 1933, or 1860, or even 1789, retconning Alexander Hamilton as America's First Black President. Of all things, it is now the nominal conservatives arguing for Year Zero, in the firm conviction that history has ended. This is like the sixth or seventh time you've posted some variation of this post. It's the only post to mine the term "ghost dance," but yes. I have composed 569 posts since July 2009. It looks like it started dawning on me in mid-2014 that I was repeating myself. I think that runs the gamut of human existence, and there's lots of overlap, so the material is finite and the other limitation is my personal creativity. It gets worse. My dad points out that mankind just keeps repeating the first eleven chapters of Genesis. I'll try and incorporate a feature above the fold that allows readers to submit suggested topics. The whole site needs a major overhaul. Truth is a broken record. You're smart so I really wish you'd focus on something more topical and relevant. Like why don't you make a post about the Flynn news, or the overall crusade of the Washington kikes against Trump, or maybe the decrepit state of British politics. Something. You disappear for weeks at a time and then you start making arcane references to Orthodoxy again. I read that stuff back in 2012. You're so much better than this. I don't know what Bert's problem is -- are you supposed to just figure this stuff out once and for all and then sail off into the sunset? Repetition is key to persuasion, persuasion is necessary to conversion, conversion will prove to be necessary to our preservation (unless we want a whole ton of pain and suffering) so AG please keep doing what you're doing. FWIW I've shared a number of these posts with my wife, but this was the one where things finally clicked for her. I am a conservative in the tradition of Burke and the Glorious Revolution but I look neither back, where there is regret, nor forward, where there is doubt. I am not a utopian. I do, however, think that we in the western world chose the wrong future - an important distinction. I am also an Old Kalendarist, which for me is the ultimate rejection of the Papacy. I'm not interested in the scientific stuff. I set the date on my wrist watch by the venerable Julian Kalendar. It's a daily reminder that my home is not here but in the world to come.